Food, friends, cocktails, and especially beer, all in one handy spot. With 16 delicious New Image Brewing beers on tap, a fully stocked bar with wine & spirits, and a kitchen cranking out amazing food, our taproom has something for everyone. Drop on by and check us out! Our menu is full of interesting and unique takes on street taco fare - everything from nachos, tacos, queso, guac and burrito bowls to salads, quesadillas and churro doughnuts. Pull up a chair and grab a bite to eat! 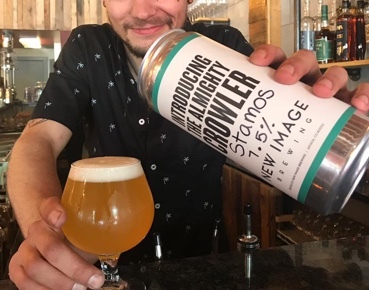 The New Image Taproom offers a variety of beers to go in the form of 4 & 6 packs of cans, and 32oz Crowlers (can growlers). Most all beers on tap can be taken home in a crowler, so stop on by and grab something special to take home! And we want you to have fun with us! Don't miss a minute of all the happenings we've got going on here, sign up for our newsletter below! Juicy, citrusy IPAs, unique takes on sours, and everything in between. Come to our taproom in Olde Town Arvada to enjoy our craft beers, craft cocktails, tapas-style food, and social dining.